Note – this recipe serves 24. Easily it can be halved. Cut bread into 1 inch squares and mix all ingredients together except for the bananas. Let soak for 15 minutes. Butter 2 deep glass baking pans (or 24 ramekins) with bread pudding mix and another layer of bananas. Top with more bread pudding until the pan is 3/4 full. Bake at 350 degrees for 20-25 minutes until golden brown. 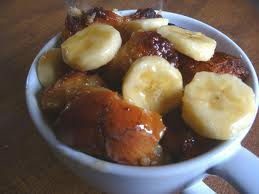 Top with sliced bananas and rum sauce. Melt butter and sugar until sugar dissolves, carefully adding rum til mixed. Remove from heat and add cream. Since it’s a Southwestern Tex-Mex theme for this tailgate, I’m going with a theme drink that’s got tequila. Hope you enjoy!